Sometime today or tomorrow, probably, Congress will pass the Tax Cuts and Jobs Act of 2017, an enormous, complicated 500-page chunk of tax law. Among other things, the new law happens to provide the best small business tax break of the last fifty years: the pass-thru income deduction. You’ll want to quickly learn and understand how this new deduction works. Understanding the law may be the key to you actually benefiting and starting your tax savings earlier. You will want to know the correct name for the new law, Sec. 199A. This small technical detail will help you do any research. Further, as soon as the President signs the law, knowing the actual section of the Internal Revenue Code that provides the deduction will help you find the actual statute. The pass-thru income deduction works for tax years starting on or after January 1, 2018. You won’t first get this deduction on the tax return you prepare and file in a few weeks. Rather, you first get the deduction on the return you prepare and file in a little over a year. A related note while on the subject of effective dates: The Sec. 199A deduction only works until 2025. In other words, the statute makes the deduction available for eight years. The deduction works for pass-thru entities, which includes sole proprietorships, real estate investors, partnerships, S corporations, trusts and estates, REITs and qualified cooperatives. The Sec. 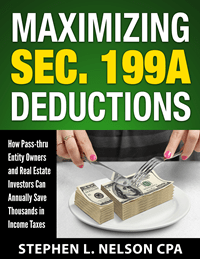 199A deduction, tentatively, equals 20 percent of a pass-thru entity’s business income. For example, and keeping the math easy, if a pass-thru entity makes $100,000, the deduction tentatively equals $20,000. I use the adverb “tentatively” a couple of times in the preceding sentences because the law includes a number of limitations on the basic formula. A sidebar comment: If you’re a tax practitioner who needs to be able to confidently and comfortably help clients with the new pass-thru income deduction, and maybe help clients with any pre-year-end preparations, you might be interested in our Maximizing Sec. 199A Deductions e-book monograph. This monograph goes into detail about how the new tax deduction works using dozens of simple examples. And it provides brief descriptions of about a dozen tactics (some simple, some not) that taxpayers may need to use to maximize their Sec. 199A deductions. A first limitation that applies to every taxpayer: Tax law limits the Sec. 199A deduction to no more than 20% of the taxpayer’s taxable income subject to ordinary income tax rates. A taxpayer with $100,000 of pass-thru income might hope for a deduction equal to 20 percent of $100,000, for example. But if the taxpayer’s taxable income taxed at ordinary income rates equals $50,000, the actual deduction equals 20 percent of that $50,000. The tax savings the deduction produces equals the deduction times the taxpayer’s top tax rate. If a taxpayer gets a $10,000 deduction and pays a top rate of 12 percent—probably the typical top tax rate under the new law—savings equal $1,200. The new deduction applies to businesses operated and real estate located “inside” the United States. Taxpayers don’t get a deduction on pass-thru income earned “outside” the United States. The law requires high-income taxpayers to either pay wages or hold depreciable property in order to get the Sec. 199A deduction. A “high-income” taxpayer includes single taxpayers making more than $157,500 and married taxpayers filing joint returns making more than $315,000. These extra requirements get complicated quickly, but basically the Sec. 199A deduction can’t be more than either 50% of W-2 wages or 25% of W-2 wages plus 2.5 percent times depreciable property. The law prohibits a handful of service businesses from taking the pass-thru income deduction if the taxpayer enjoys a high income, so over $157,500 if the taxpayer is single and over $315,000 if the taxpayer is married filing a joint return. The “handful of service businesses” includes most traditional professional service firms (but not engineers and architects), athletes, performing artists, investment managers, and any business that depends primarily on the skill or reputation of one or more employees or owners. The extra requirements that apply to high-income taxpayers and service business owners don’t immediately “kick in” at $157,500 or $315,000 of taxable income. Rather, complicated little formulas “phase in” the requirement to have wages or property as a single taxpayer’s income rises from $157,500 to $207,500 or as married taxpayers’ incomes rise from $315,000 to $415,000. Because the new deduction provides big savings and the law is complicated, the follow-up rules from the IRS will surely require taxpayers and their accountants to do better accounting. The pass-thru entity’s accounting system will need to track both the business income the firm earns and then the non-business income the firm earns (non-business income includes things like investment income and capital gains). For high-income taxpayers, the accounting system will need to track W-2 wages, depreciable property and then for service businesses (probably) both service income and non-service income. Note, too, that the K-1s prepared by partnerships, S corporations, trusts and then estates will need to provide more details on all of this sort of stuff to their owners and beneficiaries so these folks can make the Sec. 199A calculations. A final comment: The Internal Revenue Service will need to flesh out the law with additional guidance in order for people to actually take the deduction. 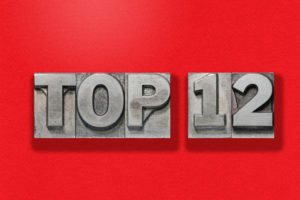 The post Pass-thru Income Deduction: Top 12 Things Every Business Must Know appeared first on Evergreen Small Business.